This year, local Keller High School Indian marching band wrapped one of the most successful marching seasons in school history. Here at Pyware, we wanted to take a moment to acknowledge their success, specifically how they closed out 2018. 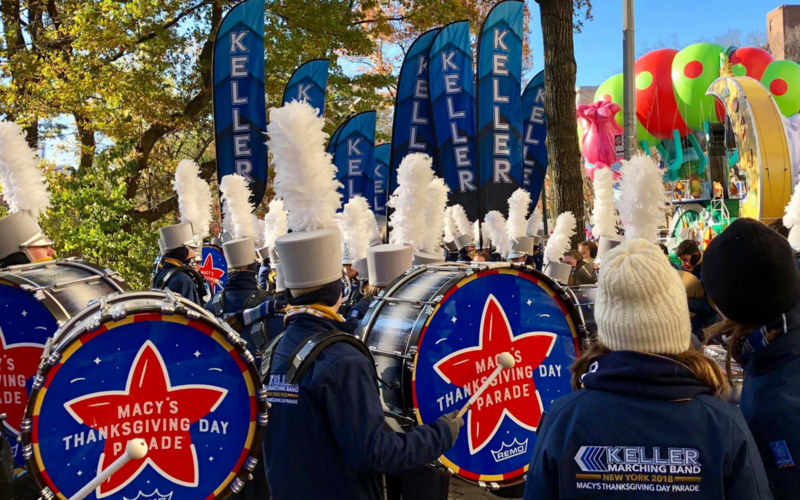 Following the submission of one of their video performances, Keller was one of ten marching bands chosen to participate in the 92nd annual Macy’s Thanksgiving Day Parade. Mark McGahey, Keller’s Director of Bands, has led the band for the past 23 years and proudly observed his ensemble stride down 34th street of New York City as the only school in Texas selected to perform. Throughout their training, the band had to overcome a few obstacles but their perseverance attests to the decision of the Macy’s committee that the Keller marching band was the one to represent our lone star state. The climate in Texas this past Fall was anything but a suitable environment for marching season, documenting off the chart amounts of rainfall. Nevertheless, the unfortunate weather conditions were not going to hinder Keller in their preparation for this once in a lifetime performance. They had to utilize their school cafeteria as a practice space! The lunchroom holds roughly 200 people at a time, so they had to get creative in order to teach a 400 member band the routine. “We learned our entire minute and fifteen second drill in the cafeteria in two halves, fitting 200 members at a time in the limited space, alternating between “Side 1” and “Side 2.” The first day we put it all together was our uniformed dress rehearsal that we sent to the Macy’s committee,” McGahey said. Designing a show for an unfamiliar venue is already an extremely taxing process, with the addition of unforeseen obstacles makes it even more demanding for drill designers and athletes. Our team at Pyware strive to make our program the “go-to” software applicable to any setting and under any circumstance. We were thrilled to hear that the Keller Indian Band utilized our software in the charting and designing of their Macy’s Day performance. “The Pyware program was so clear and helpful as we designed the show based off the specifications of the street. The template and accuracy of the grid options was a lifesaver,” McGahey said. It was truly special to watch not only a local marching band perform at the parade but that Pyware was able to help in the design of such an incredible show! Due to the donations from the Keller community and supporters of the band, the band was able to travel to Times Square and perform in front of millions of viewers. The students and directors withstood the blistering wind and frigid temperature to execute an impeccable performance. Congratulations once more to the Keller High School marching band and we look forward to watching the program continue to thrive!